Today is Clinical Trials Day – celebrated to bring more attention to public health and also to recognize the contribution of the patients and healthcare professionals who make clinical research possible. 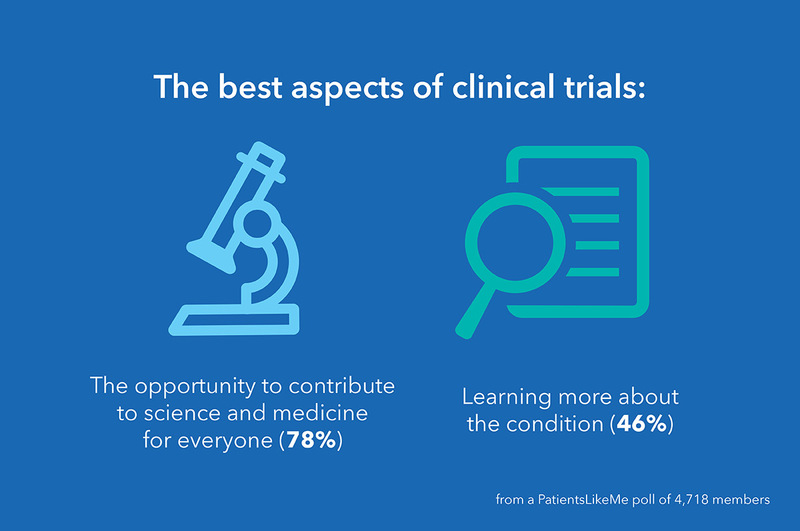 At PatientsLikeMe, it’s members who are changing the way clinical trials are designed. 4,718 PatientsLikeMe members took part in the survey, and below is just a snippet of what they had to say. The complete findings of this study have also recently been published – take a look! 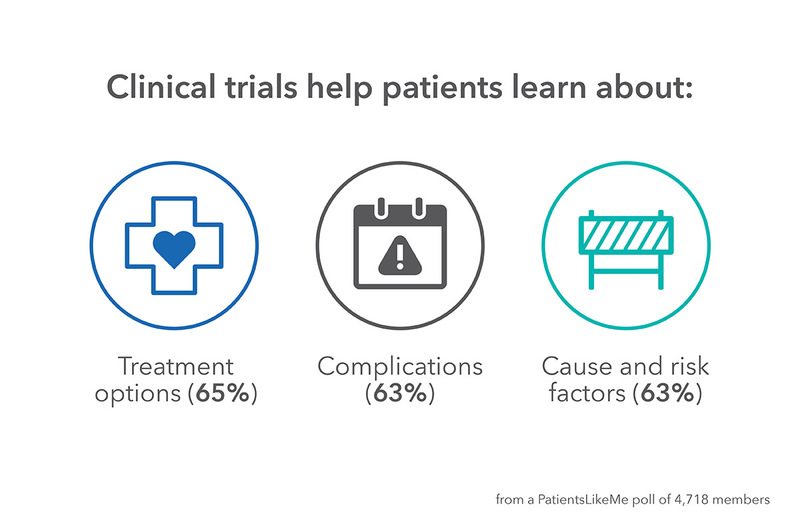 How do patients learn about clinical trials? 59% of those who responded said they learned about a trial from their health team, while 24% said they learned via the web. For those who participated in past trials, the first person to suggest they participate was a doctor (43%) or another healthcare provider (19%), and 80% of respondents said they took part in the trial based on their own desire to. Most people are still finding out about trials through their care teams or providers, but when it comes to making a decision to take part, it’s their own desire that motivates them. 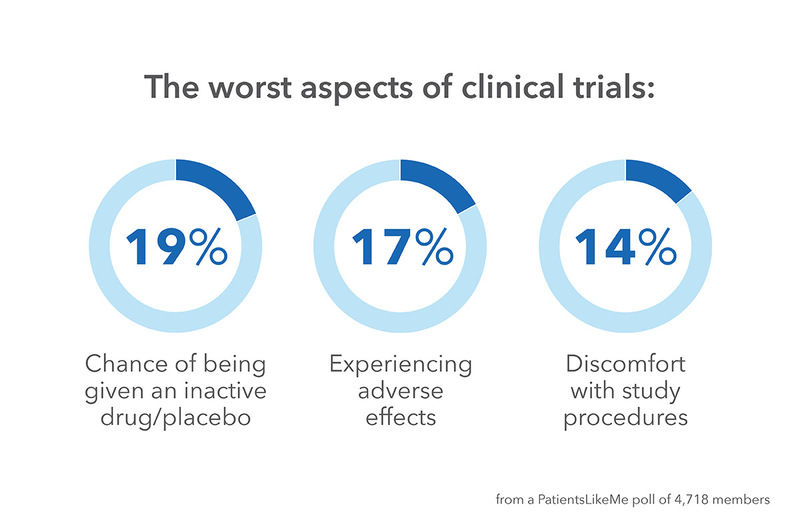 What are patients’ impressions of clinical trials? Of those who responded, 55% were very or extremely satisfied, and 51% would tell other patients about the trial. 9% of those who answered the survey considered dropping out of their trial — side effects and worsening of overall health after the trial were the main reasons. Following the conclusion of a trial only 38% of patients recall being told about the results. To find out more about clinical trials and how to get involved, visit the PatientsLikeMe clinical trial finder tool. Find a trial that’s right for you, search by location, phase, intervention type and more. Thank you to all who participated and shared their experiences to help bring the patient perspective into improving clinical trials. You touch an extremely important topic. To leverage the outcome of clinical trials for participating patients a role should be defined. And – a feedback to participating patients should be mandatory. Not all trials involve placebo. I have been in 3 trials with no placebo. II did receive a placebo my treatment would not be compromised. More patients should participate to move research forward. Being a snowbird may not be a blanket exclusion to participate in a clinical trial – it may be more a factor of the travel and time away that could affect one’s ability to meet all of the study obligations and continue to be evaluated and assessed at the study site at the appropriate time points. This depends on the trial requirements and the timing of clinic visits and how traveling away from the trial’s primary location throughout the year might impact that. It may not be a fair blanket statement to say that all snowbirds are ineligible for clinical trials, but it would likely complicate participation in a number of studies if travel and time away affects clinic visits. A conversation that might perhaps be worth pursuing with your Neurologist is around any potential shorter trials that wouldn’t conflict with your travels. I completely agree that being a snowbird does not make a person ineligible for clinical trials. It is shocking that a physician would say this to a patient. I have worked in the pharmaceutical sector for the past 12 years, and it has been my experience that most clinical trials have so poor patient recruitment numbers, that they are willing to be very accommodating for patients. In some instances, paying for patients to travel or conducting visits at the patients home. Sadly if you research the topic, you will find that less than 10% of doctors in the US are willing to suggest clinical trials to patients, despite the fact that in many cases the current standard of care is ineffective. Please advise your readers to seek out clinical trial information from an unbiased source, like clinical trials.gov, to find a trial that could help them. Recent family issues have brought this topic close to my heart, and I would be willing to help anyone who needs help to find a clinical trial that they may be eligible for.